10513-71 London Life. Arrest of a militant suffragette. Rotary Photo E.C. When “the Law” takes up the job?”. 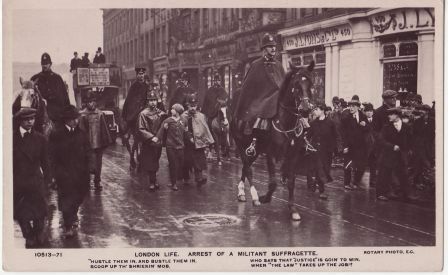 This postcard features the arrest of a suffragette, later identified as Mary Phillips. She has a policeman at each arm and the group are escorted by around six mounted police and others on foot. A male crowd watches as the group pass. Behind them is a bus heading to Kings Cross. A biography of Mary Phillips is available in Crawford’s The Women’s Suffrage Movement and online at Spartacus Education and a photograph of her at Bath in time. 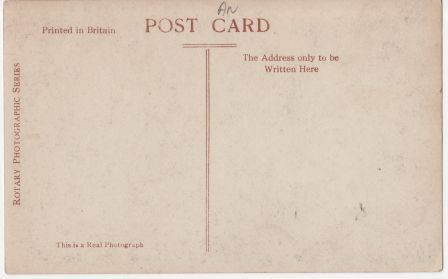 Copies of the postcard can be seen at the Museum of London and Diomedia. All those policemen to arrest one unarmed woman. Yes, a little over the top isn’t it. Although the suffragettes were pretty feisty! They weren’t little violets, bless their determination and grit.